Personalise with any name and date. These beautiful tote shopper cotton bags have long handle shoulder straps and they are light weight. Personalise with any name. 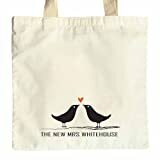 Great gift bag for your wedding party , Hen or bridal shower Bride to be.